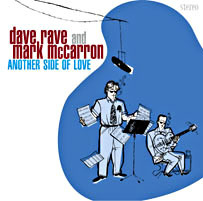 Ex-Teenage Head singer Dave Rave teams up with cool guitarist Mark McCarron & hot NYC jazz cats for a very sweet understated brushes / stand-up bass / organ / guitar journey through all the stages of a love affair. Dave Rave (aka David DesRoches) is a musician's musician. To punkers, he is the manic Teenage Head rhythm guitarist who replaced Frankie Venom as lead singer and catapulted the band back on the charts, and then split to New York to head the Dave Rave Conspiracy, play with The Washington Squares before running off with Lauren Agnelli for three lps as Agnelli-Rave. Musicians know him as a valued session player (Alex Chilton, Steve Wynn, Ralph, Dan Lanois, Andrew Loog Oldham, Tim Gibbons, and countless others) who can play the best version of a song he hasn't heard yet. Recorded in New York City; Another Side Of Love features an exceptional rhythm section of New York's jazz underground. Ray Grappone is a producer (Groove Collective) and label owner (Hipbone Records) in addition to in-demand percussionist and drummer. Bassist Joe Fitzgerald plays in Human Feel (with drummer Jim Black and Chris Speed on tenor sax).